The share of manufacturing in GDP is declining, whereas the share of services – and business-related services in particular – is rising in almost all advanced economies. 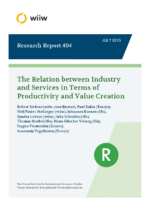 However, as these industries are mutually dependent in various ways this study focuses on the manufacturing sector as a user of activities provided by the services industries and – in particular – the way the latter contributes to productivity and value creation in the former. To the extent that this is the case, manufacturing industries benefit from a vibrant business-services industry and themselves play an important ‘carrier function’ of services – issues which are addressed by considering manufacturing activities in a value chain approach. As a consequence, EU Member States facing a declining share of manufacturing might still be part of the manufacturing value chain via the provision of services whereas other countries benefit from services provided by other countries. The role of cross-border flows of services and the patterns of outsourcing and offshoring of such activities across Europe is therefore gaining importance. It is argued that a differentiated pattern of specialisation emerged within Europe with a set of countries keeping a stronghold in manufacturing industries and others are specialising in the provision of related services, whereas some countries have faced a decline in their manufacturing shares, but have not succeeded in increasing their specialisation in business services either. The first four sections of the study present selected quantitative indicators concerning the ‘manufacturing value chains’, discuss the relative importance of the manufacturing–services interaction and its cross-border dimensions, and point towards differences across countries, industries and services activities, and the respective changes over time. Further, impacts of these interactions on manufacturing performance are addressed econometrically. The following two sections highlight important dimensions of services use in manufacturing and issues related to services trade and potential barriers in that respect for selected industries and countries, incorporating both quantitative and qualitative insights.